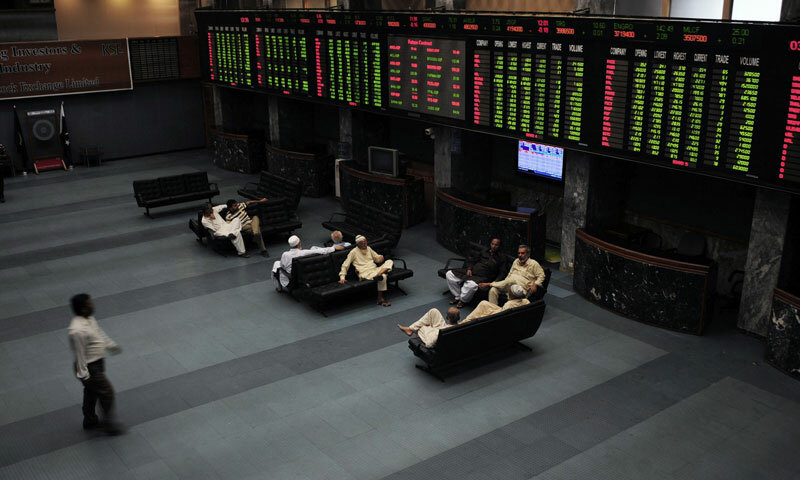 KARACHI: Stocks roared past the 22,000-point mark on Tuesday as the bullish fervour gripped the market, investors excited by the positive vibes from the PM visit to the US and the result season getting off to a flying start. The benchmark KSE-100 index surged by 2.19 per cent or 475.48 points to close at 22,230.43. Foreign investors were again the lead buyers, who soaked up stocks worth $5.73 million on Tuesday. Including net purchases of $4.94 million the previous day, foreign institutional inflow into equity market crossed $10m in two days. An analyst said that as the debt ceiling crisis in US was resolved in the preceding week when market was closed for Eid holidays, the foreign flows had now started to pour in the KSE. The market trend for the first two days of this week is seen to be in sharp contrast to the earlier three weeks of depression that left many investors with huge losses, pushing volume to 14-month low. However, on Tuesday, the market witnessed decent turnover of 167 million shares, up 23 per cent over the earlier day�s business in 136m shares. Trading value jumped 60 per cent to Rs6.365 billion on Tuesday, from Rs3.98bn, representing growing participation of first-tier, high-valued stocks. The news flow from US was greatly encouraging. The US State Department was said to have asked Congress to resume more than $300 million in blocked security assistance to Pakistan, amid an upswing in relationship between the two countries. Prime Minister Nawaz Sharif�s invitation to the American entrepreneurs to avail the tremendous business opportunities in Pakistan in a gathering of prominent business leaders at the US-Pakistan Business Council was also sentiment booster for investor in equities at the local bourse, who were eagerly awaiting the outcome of Sharif�s meeting with the US President on Wednesday. A bevy of financial results for the quarter ended Sept 30 also energised investors, though some of the financial numbers, like those of D.G. Khan Cement, Efoods and PTC, fell short of expectations. Samar Iqbal, AVP Equity Sales at Topline Securities observed that investors built fresh positions in anticipation of better corporate results, PM visit to US and ADB approval of additional grant. Institutional support in banking and oil sectors helped index to recover by over 2 per cent. Cement stocks continued to rally on expectations of better Sept results, MLCF, KOHC, PIOC, CHCC, closed at �upper circuit breakers� while Lucky cement gained 4.6pc. FCCL also closed on its upper cap on second consecutive day after announcing splendid earnings on Monday. Ahsan Mehanti at Arif Habib Corp stated that the bullish activity was fuelled by expectations ahead of the PM meeting with the US president, revival of US $300m security assistance, US congress approval on release of $1.6bn economic and military assistance to Pakistan and outlook of record quarter-end earning announcements in oil, cement and banking sectors. Volumes remained high following rupee stability, renewed foreign interest in equities and rising foreign exchange reserves. In all, stocks of 305 companies were traded with gainers and losers in the ratio of 194 and 91. Market capitalisation shot up by Rs80 billion to Rs5.255 trillion. Among the top-10 volume leaders, Fauji Cement hit the �upper circuit� with increase of 99 paisa in stock value to Rs12.51 on the day�s highest turnover at 31m shares. PTCL also finished �limit up� by Rs1.10 to Rs26.45 on 16m shares, Lafarge Pak was up 32 paisa to Rs8.33 on 10m shares, D.G. Khan Cement inched up by 16 paisa to Rs71.79 on 8m shares, NBP gained Rs2.04 to Rs52.22 on 8m shares.